There are a number of old roads criss-crossing the north that were used as early postal routes and there are others which are currently used as forestry access points. Beware that some of the bridges on some of these routes are not always in great repair. This is the old postal trail between Ylimuonio and Hetta. There is an open hut in Puolitailval which can be rented if you wish to stay overnight on route. The northern 21km portion of this trail is effectively an old lost trail, with only a few upright mile markings. 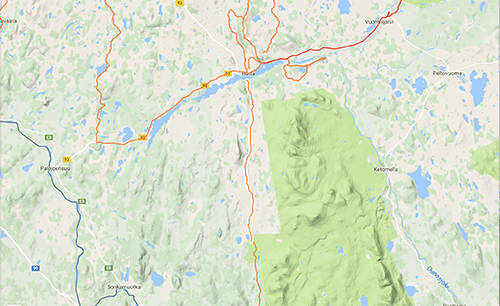 The second part of the trail, shown (23km), has been digitally mapped. 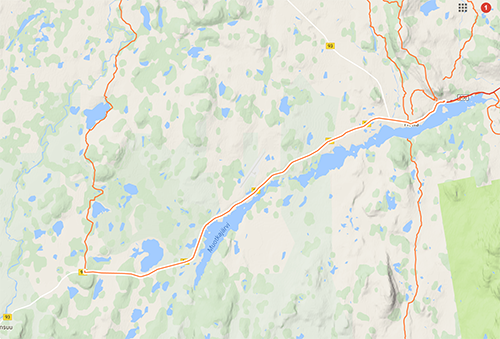 An alternative option, when moving between Muonio and Hetta is to use the forestry roads which branch off after Sonkamuotka and effectively cut the corner off the main road which continues due North and then due East. 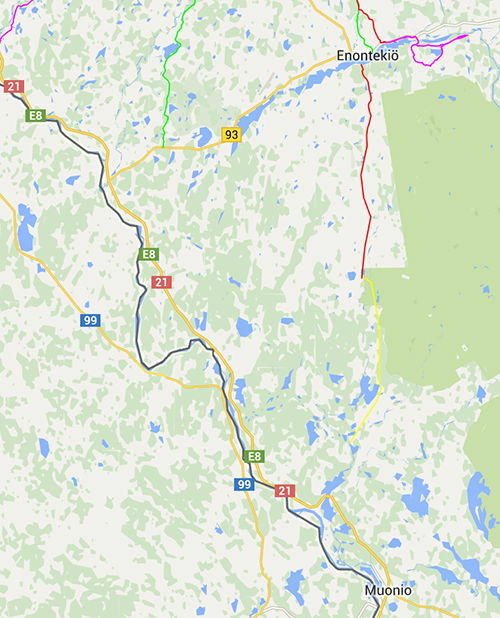 FYI This map doesn't show this route but from it you can clearly see the separation between Hetta's two big lakes. 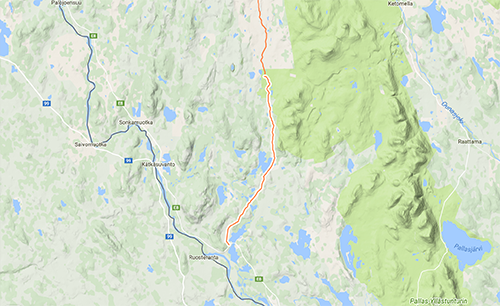 You use the asphalt to reach the turn-off point just after a large layby and before a bridge under which a snowmobile route passes in the winter. The forestry road goes first south and then west, so you effectively bike the two opposite sides of a rectangle to get to the same place but the gravel road is much more interesting than the main road. Bare in mind that you have to go South until you hit a T-junction and then you will have to look at your map for the next section of trails en route back to the main road to ensure that you don't keep going down trails which have dead ends. Be careful not to just follow the most heavily used trails since the most recently open roads are dictated by where the felling is happening. In other words, it is surprisingly easy to get lost along this connection route. Despite 'just' being on forest trails, the scenery on this route is very pretty and it is well worth the effort. These gravel roads are generally drivable by normal cars and are lorry-wide since they are made and maintained purely for forestry purposes. However, the surfaces are quite bumpy so you will be happy if you have front suspension at least. The Hetta-Pallas trail within the Pallas-Yllästunturi national park was finally opened to bikers in the summer of 2017. When considered in conjunction with the already existing trails, that means that there is a continuous c.300km XC mountainbike trail now open...one of the longest in Europe. It is, of course, also possible to continue north from Hetta on any of the trails described in the other biking pages and to bike another c.200km until you reach the arctic ocean. If you consider the trails in the national park alone, there is a network of 900km of trails of different standards available. 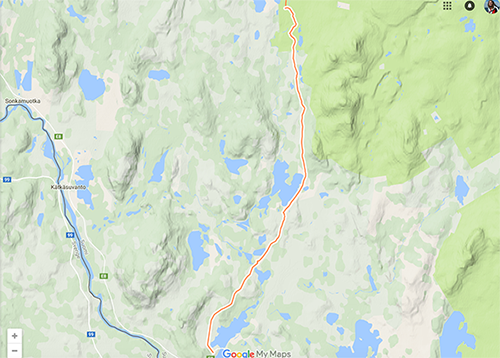 Ylläs in particular, in the south of the park, has been developing and mapping its year-round trail network for some time. In winter, c.90km of trails are groomed and maintained regularly - primarily for the increasingly popular fat bikes. Many of the trails link into unique wilderness cafes that previously have only been accessible by cross country skis.